There was an outpouring of condolences and heartfelt tributes on Facebook, after the weekend road carnage, on the M4 near uMhlanga, claimed two lives when a biker and a Toyota Corolla collided head-on on Sunday morning. A passenger and the biker were declared deceased on the scene. Reaction Unit South Africa (RUSA) received multiple calls from the public requesting assistance for the injured and RUSA head, Prem Balram, said paramedics were immediately dispatched to the scene. “Upon arrival, paramedics from a private ambulance service were assessing a female who was a passenger in the Toyota Corolla. She was found to have sustained life-threatening injuries and died at the scene. The biker was found several metres away from the point of impact. His bike disintegrated in the high impact collision which resulted in him being fatally injured. The driver of the Toyota Corolla sustained moderate injuries and was transported to Victoria Hospital by ambulance,” Balram added. 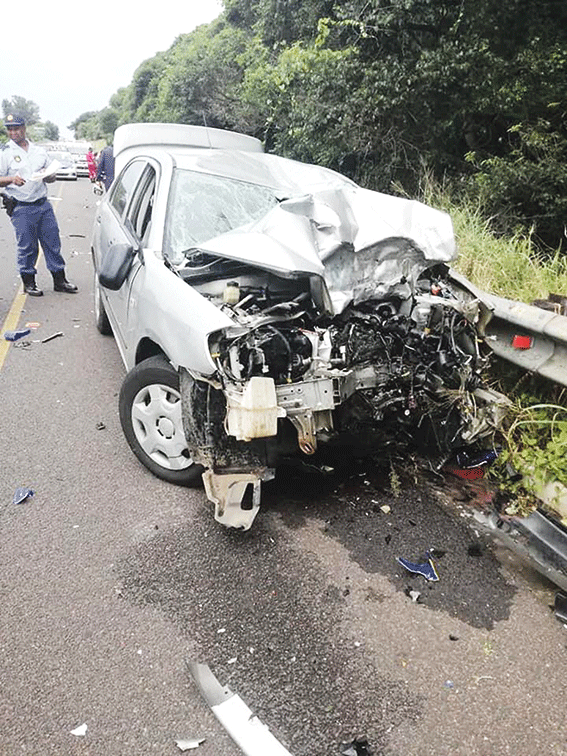 “The driver of the Toyota Corolla explained that he and his wife were travelling north just past the uMhlanga on-ramp when the biker who was travelling in the opposite direction allegedly veered into their lane and collided into their vehicle,” said Balram. Facebookers identified the deceased biker as Malvin Naidoo. Friends, family and members of public took to social media to share their grief over the tragic deaths of the two victims with some denouncing the M4 as notorious for head-on collisions. ‘Reunited with a host of family gone before… ..God chose the best rose in the garden…you were your mum’s pride and joy which is now shattered …RIP my dear nephew,’ (sic) a family member shared on the untimely passing of the young biker. ‘R.i.p my beautiful aunt’ (sic) and ‘RIP Raghu and Malvin,’ (sic) were among the messages posted on the Reaction Unit Facebook page.